Nine had the No.1 “event” broadcast with the first QLD vs NSW State of Origin game pipping Seven’s AFL Grand Final. Telstra Live Pass reported 2.3m subscribers across all its sports in 2018. In August, Telstra broke a record for the most mobile devices streaming sport on its apps in a single weekend, with 1.2 million individual devices streaming NRL, AFL and Netball through the sports’ apps. At one point on the weekend of August 10-11, 82,120 viewers concurrently streamed the Hawthorn versus Geelong AFL match. Across all the sports apps, the highest number of concurrent viewers to date is 109,000. The 2018 FFA Annual Review doesnt address TV ratings at all. In February, AAP quoted David Gallop saying no one was overly happy with the present ratings. “No-one could be happy with the pure output, in terms of numbers around attendances and ratings,” he said. In October, Fairfax noted that television audiences remain a problem across the league. Some 69,000 people watched the Melbourne derby on Fox Sports, compared to 121,000 for the first edition of the rivalry last year. Figures for free-to-air audiences on One were unavailable. The other two Melbourne derbies in 2017-18 had Fox Sports audiences of 77,000 and 59,000. The Adelaide and Sydney season opener was watched by 67,000 people on Fox Sports, more than 30,000 less than the A-League’s opening game last year. It was the lowest television audience for a season opener since 2011-12. Mediaweek offered a list of the average TV Ratings per season on Foxsports. In November, News Limited noted streaming complicated things but that it’s highly unlikely that the “missing” viewers account for the shortfall in A-League viewers. The article also notes that streaming service operators arent releasing figures. The cumulative gross national audience during the home and away season exceeded 89 million (89,348,093), which was down on the 102.3 million (102,337,684) in 2017. The 89 million viewers comprised 52.71 million viewers on free-to-air and 36.63 million viewers on subscription television. The AFL noted early season scheduling challenges, as well as emerging digital platforms as possible reasons for the downturn. Friday night matches during the 2018 AFL Premiership Season attracted a national average audience of 958,432 across free-to-air and subscription television, down on the 2017 average of 1,143,699. The seven Thursday night matches attracted a national average audience of 987,127 across free-to-air and subscription television which exceeded the average audience for Friday night matches. Fairfax noted that the 2018 match average was 307,793 for the AFL (down 13 per cent on 2017), acknowledging that the AFL has cross-over timeslots and doesn’t go free to air with the same games nationally. The average Foxtel audience was 184,821 for the AFL (down 7 per cent on 2017). The 2018 AFL Grand Final national average audience (metropolitan and regional) of 3.39 million (3,386,253) on the Seven Network was fve per cent down on the 3.56 million who tuned into the 2017 Grand Final between the Adelaide Crows and Richmond. The combined five mainland capital city metropolitan audience of 2,609,707 viewers for the 2018 AFL Grand Final made it the most-watched program on metropolitan free-to-air television in 2018. The Seven Network also exclusively broadcast the Brownlow Medal live and attracted a national average audience (metropolitan and regional) of 1,141,414. According to the 2018 Annual Report, streaming of live matches through the AFL Live app grew by 13 per cent to more than 450 million minutes compared with 2017. The League reported more than 1.6 million Live Pass Subscribers. This is the equivalent of 7.5 million hours, or 2.5 million full matches, and works out to about 12,000 viewers per full match. Fairfax reported at the end of round 25, that television ratings for the NRL season had eclipsed the AFL’s audiences for the first time since 2010, reflecting the closeness of games in the rugby league competition compared to AFL. The article notes that the NRL had also bucked the overall trend in the Australian TV market, where cumulative ratings have experienced a decline of 7.2 per cent in total over the last year. The average free-to-air audience for the NRL was 600,181 in 2018 during the premiership season. 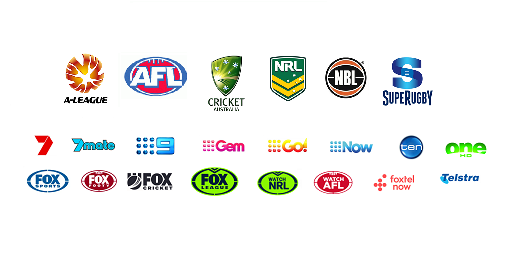 The average subscription TV audience (Foxtel) for the NRL was 240,879 in 2018 (up 3 per cent on 2017). The highest watched team was the Broncos, with a live audience of more than 18m over the season. The second-highest watched team nationally was the Cowboys – with nearly 15m viewers over the season. Origin 1 was the most watched sporting program of the year with 3.44m viewers, with Origin 2 coming at #4 and Origin 3 at #8. The 2018 NRL Annual Report notes that the number of people watching rugby league on television across Australia and New Zealand rose by 1.1 per cent in 2018, with a total aggregate broadcast audience of 116 million for 2018. Telstra reported that the the NRL Official App delivered almost 400 million minutes of exciting rugby league action to a fan base that grew by an incredible 60 per cent this year. With 540,000 NRL Live Pass subscribers reported in 2017, this would give about 860,000 Live Pass subscriptions in 2018. This works out to around 6.7 million hours, about the same as 3.3 million matches and about 16,000 viewers per full match. Fairfax reported that average streams of games per round increased by 108 per cent between 2017 and 2018. Newcastle were awarded the Most Streamed Team at the 2018 Dally M Awards. The Knights were watched by a cumulative audience of 1.7 million fans throughout the season – and had to fend of challenges from last year’s winning team, the Manly Sea Eagles, as well as the New Zealand Warriors and Melbourne Storm, who all made the top four. The most streamed game was Round 7, NZ Warriors v St George Illawarra Dragons. Fairfax reported that total viewership of NRL on Sky in New Zealand is up by 21 per cent, year on year. Broadcast revenue: Not available yet. The 2018 Rugby Australia Annual Report is yet to be released. Rugby Australia figures showed Super Rugby matches played in Australia attracted an average audience of 71,000 last year, up nine per cent on 2017, a season that was dogged by speculation over which Australian team would be cut from the competition and by a record poor performance from the NSW Waratahs, the team representing Australia’s largest fan base. Fairfax reported that further Oztam ratings obtained by the Herald showed that figure plummeted in the five metropolitan cities, attracting an average pay television audience of just 50,000, which was less than the A-League’s 51,000 and a fraction of the NRL’s 164,000 and AFL’s 167,000. The Super Rugby picture was worse when the competition’s overseas games were factored in, falling to an average audience across of 23,000 across the five metropolitan cities.